If you can dream it, we can build it. From conception to completion, we have a process that will leave you feeling confident in your investment. At Hickory Dickory Decks we think this process should be an enjoyable part of the experience. Our process will guarantee you a deck project that is beyond your dreams but not beyond your budget. Making initial contact with Hickory Dickory Decks is a must. We will not cold call you. Check decks.ca or call us at 905-689-4774. If your local sales representative is not at his/her desk, we will return your call within one business day. An initial conversation about your project will be done over the phone. An appointment will then be set up for our representative to visit you at your home. From there, we will take measurements and pictures. We like to then sit down with you to discuss the particulars of the project. It is here that we are able to uncover both your needs and wants in a new deck. Our goal for this meeting is to educate you on the benefits of low maintenance decking and to discuss budget and timeline. Some of our questions might have you wondering why we’re so nosey but our questions are designed to help us design the deck of your dreams. We like to answer questions too. If we don’t have the answer, we’ll get it. Your sales representative will then proceed to the office to design and quote your new deck. Unlike many of our competitors, designs are free of change. Often more than one design will be provided, giving you as the homeowner even more options. Once designs are complete and quotes are finished, we will have you into our head office to receive these. It is here that the magic happens. 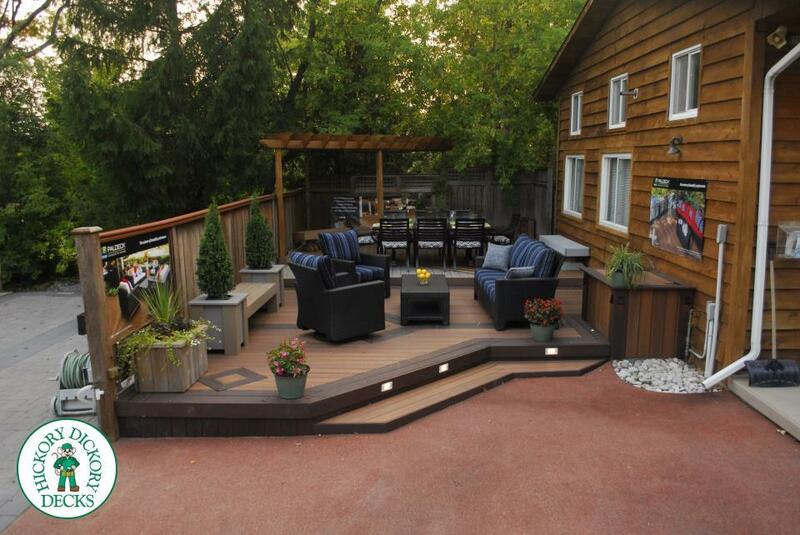 Our outdoor showrooms feature an acre and a half of decks here at our head office. This enables us to show you multiple products in “deck form.” We consider this superior to the usual four-inch sample. Here you will be able to see how these low maintenance products age, as many of our decks are more than 5 years old. Everything deck related can be found here at head office. From rails to gazebos, Hickory Dickory Decks will provide the visuals needed to make the important decisions. Your sales representative from Hickory Dickory Decks will go through your quote, line by line and answer any questions you might have in regards to pricing. Our quotes are fashioned in a way that allows us to show you many different products, allowing you some control yourself for staying on budget. This second sales call will take about an hour and we like to refer to this time spent as an experience, not an appointment. If you have decided on a Hickory Dickory Deck, a deposit of 30 percent will be taken. This gets your project into the schedule, your permit applied for and materials ordered. A second payment of 30 percent will be due the first day of construction and can be given to your builder. Our carpenters only build one deck at a time and will be onsite until the project is complete. A third payment is due the day the floor of your deck is complete. The final 10 percent is held back until you are completely satisfied and can’t live without your new deck. Throughout the sales process at Hickory Dickory Decks, communication is key. Never hesitate to give a call with any questions. We hope you enjoy the process as much as the deck and look forward to working with you in the future. And don’t forget to enjoy life…outdoors.